Home &sol; Dangers to Wildlife &sol; Can you Prevent Bird Deaths from Window Strikes? According to the American Bird Conservancy (ABC), a federal study in 2014 found that “up to one billion birds die each year in the United States when they hit glass windows, walls, and other structures, making this threat one of the most costly to bird populations.” The study authors, Scott R. Loss, Sara S. Loss, and Peter P. Marra of the Smithsonian Conservation Biology Institute, and Tom Will of the U.S. Fish and Wildlife Service, reviewed twenty-three prior studies. According to these studies, the biggest culprits among building types are low rises of four to eleven stories – responsible for 56% of bird deaths. High rises, greater than twelve stories, are responsible for less than 1% of deaths. Solutions for this part of the problem rest primarily with architects who design these buildings. Mitigation by design is possible through use of overhangs or fritted glass. This is glass which has patterns incorporated right into the surface during manufacturing. And there is even a UV coating that can be added to glass during manufacture, that can be seen by many types of birds, but not by humans. Dr. Christine Sheppard of ABC has written a pamphlet called Bird-Friendly Building Design. She reviews why birds don’t see windows. Reflections of trees or sky on the glass make them think they’re flying towards more trees or the sky. Sometimes, birds may even see through a room or building to foliage beyond windows on the opposite side. So, they think they have a clear path to fly right through. It turns out that almost 44% of fatal bird crashes happen at residences of one to three stories. Here are some ideas about what you can do to help – especially if your residence is surrounded by lots of trees. The most lethal situations tend to involve large “picture” windows or corners where windows are placed at 90 degrees. One solution is to place tape on the windows. The American Bird Conservancy recommends that strips should be four inches apart if vertical, or two inches apart if horizontal. This is known as “the 2 x 4 rule.” Another method is to paint patterns on the glass using tempera paint and stencils or sponges. It’s common to see decals shaped like owls or hawks on windows. The problem is, birds don’t perceive these as predators – just as solids to be avoided. A big decal here or there won’t help that much. To be truly effective, these decals must be spaced no more than 4 inches apart – just like the vertical tapes. There are also one-way films that make the glass appear opaque from the outside. And other films have a pattern of small dots which cut glare and create enough “solids” to keep birds from seeing a void space. For a solution which doesn’t adhere to the glass, there are closely spaced, dangling ropes or chains – sometimes referred to as “zen curtains” – that hang in front of the windows. Nets can stop birds before they get close to the glass. These must be stretched tight, so birds bounce off and they must be fine gauge, so the birds don’t get tangled in them. Full-size insect screens on window exteriors are a good solution. And awnings or overhangs that reduce glare on the glass, as well as exterior shutters, are all good remedies. 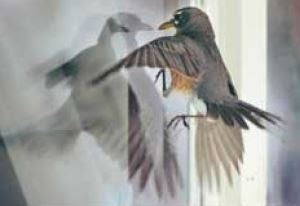 Ironically, clean glass is much more likely to cause birds strikes than dirty glass. So, perhaps the least expensive and least labor intensive method to help prevent bird strikes is not to clean your windows!